Rain to grass is what gasoline is to fire. In just a couple of days, the grass would have grown to require mowing. However, it is not advisable to cut grass when wet. Wet grass tends to bend over due to the weight of water on their blades making it difficult to achieve a straight cut during mowing. You can cut your grass by using either a lawnmower or a string trimmer, also known as a commercial weed eater. This step is unnecessary if you are using a string trimme﻿﻿﻿﻿r. In case you are using a lawnmower, set its blade to its highest cutting setting and turn off the mulching feature. This will prevent the death of grass that is underneath the clumps if raking is not done quickly. If your mower has a bag attachment, ensure you remove it and then set the mower to blow grass out via the side-discharge event. Start by cutting your lawn around its perimeter. While doing this, ensure the commercial weed eater or lawn mower is set to blow the cut grass in a direction away from the center of your lawn. Do not be in a hurry when cutting to give the mower or trimmer enough time to cut through the wet grass adequately. Once you have cut the perimeter of your lawn, you should take another strip on the outer edge of the unmowed lawn so that you cut progressively inwards. Ensure the cut grass is through in the direction of the already mowed part of the lawn and away from the center of the lawn. A good advice is to cut half rows only such that one-half of the mower blade is on the already cut part while the other half remains on the unpowered part of the lawn. This means the cutting blade of the mower or the string of a weed eater only has a little amount of wet grass do deal with. You will need to take periods of rest to remove any clumps that may be in the cavity of the mower if you are using a mower. Make sure you shut off the mower before and the blades have stopped before removing the clumps. Do the same with a string trimmer. Removing the clumps will ensure the wet cut grass is blown or thrown easily. 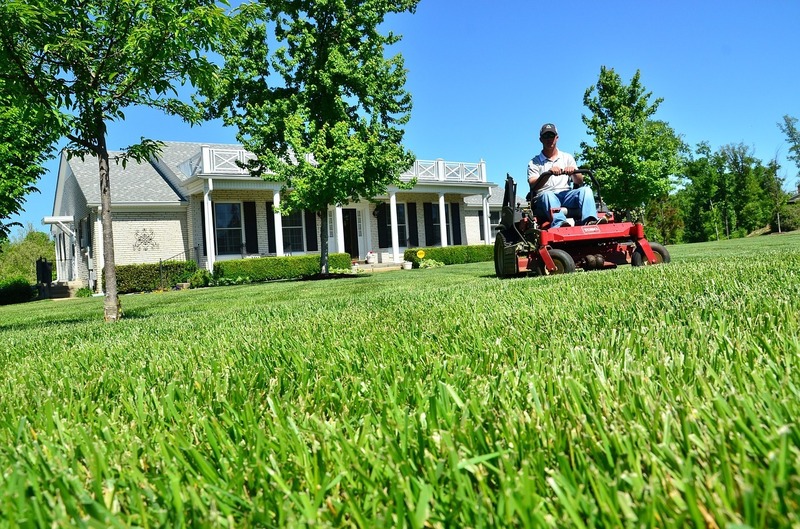 Once you have cut grass on the entire lawn, take the time to thoroughly rake off wet grass clippings from your lawn. Some landscapers recommend that you wait a day or two and run the commercial weed eater or lawn mower over the lawn to spread the grass clippings uniformly over the lawn and let them decompose to add nutrients to the lawn. However, the grass clumps could ruin your lawn so it is best to rake off the glass altogether. There is no need to wait until your grass dries if it has overgrown and it is a rainy season. If you use the right techniques, you will still achieve straight, good quality cut and maintain the aesthetic appearance of your lawn. Many homeowners have used these tips successfully. One thing you need to keep in mind is never to rain while it is raining as the rainwater may harm the mechanical components of your commercial weed eaters or lawn mower.